Author’s Note. Parts of this article are taken from the Nine Chthonic Papyri of Heknusret the Temerarious, former member of the Honorable Society of Portal Wizards, a secretive order of Nurian mages based in the city of Per-Anu who seek to control the mysterious Red Portals. Heknusret travelled through dozens of Red Portals to many different times, places, and worlds often with little regard for his own safety, meticulously recording his discoveries in a collection of scrolls known as the Chthonic Papyri which he kept inside a leather scroll case embossed with the symbols of Anu-Akma, Lord of the Underworld—a golden ankh and a golden scythe. Heknusret was expelled from the society for his failure to safeguard the secrets of the portal wizards when his scroll case was stolen during a visit to the River King’s Court in the Arbonesse. Copies of the Chthonic Papyri have since appeared for sale in the markets of cities such as Bemmea and Mhalmet and always fetch astronomical prices. But owning these scrolls is dangerous—the portal wizards actively hunt down and eliminate anyone in possession of their lore who is not a member of the society. A number of Red Portals lead to the fabled City of Brass, but I have always found the most reliable to be the one located in Kel Azjer, the hidden city of the Tamasheq. Head east from the Plaza of the Aeromancer along the Street of Amphorae until you come to a small temple with a cobalt dome. There is a brass plate on its wooden door depicting an armored knight mounted on a war camel. Rub the nail set in the rider’s navel twelve times to open the portal. Step through the glowing red doorway, and you will find yourself on the bustling streets of one of the greatest cities in the multiverse—the City of Brass, home to the efreeti and their powerful grand sultan. The city is rightly famed across the planes for its markets, bazaars, and souks. Here, a visitor can find many wondrous things available for sale. The trick is knowing where to look. One promising spot where I have made a number of worthwhile purchases over the years is the Bazaar of Ineffable Wonders, a splendid covered market on the banks of the Incandescent Canal, not far from the Blazing Mosque. The bazaar is built from basalt in the shape of a giant cross—each section is over 300 yards long and can be entered through one of four impressive gates. The bazaar’s roof is topped with a series of copper domes adorned with gold filigree, and rectangular windows high in the walls bath the interior in the eerie, red light of the Plane of Elemental Fire. At the central point, where the four arms of the cross meet, is a much larger dome; the inside of this impressive cupola is decorated with a spectacular mosaic of gold and glass tesserae of dazzling colors, depicting the Grand Sultan Ixingaltrix holding court in his throne room as the other genie lords prostrate themselves before him. The Bazaar of Ineffable Wonders holds over 500 shops, selling all manner of marvelous things, many of which I have only ever seen for sale here. As they are in the Southlands, shops selling similar goods are often clustered together, making it hard to find the particular establishment you seek. As you wander through the bazaar, the heady smells of incense, tobacco, and roasting meats merge with the pungent aromas of exotic spices, herbs, and oils. There are magical items to buy here, of course, but there are mechanical wonders too, and a visitor in search of a beautiful carpet, a finely wrought weapon, or a rare tome will not leave disappointed. Whenever I visit the bazaar, I make a point of stopping at Mubarak’s Emporium to see his newest clockwork inventions. Like most shops in the bazaar, Mubarak’s is packed with merchandise, its contents spilling out into the walkway. Larger mechanicals, including a clockwork steed and a bronze scorpion, stand outside while the shelves and display cases inside are filled with all manner of smaller, more intricate items. Mubarak al-Hariq, an irascible azer clockwork mage, runs the emporium and crafts everything for sale here himself. He makes his bigger pieces in a workshop elsewhere in the city but builds the smaller clockworks right in the shop, and I usually find him tinkering with some kind of mechanism or other on his workbench whenever I visit. Abdul, a mechanical monkey, acts as his assistant, fetching tools, gears, and screws from a cabinet with many small drawers. Occasionally he produces the wrong item, prompting a frustrated Mubarak to swear colorfully at him in Ignan. Mubarak greets new customers with suspicion and a scowl but is the most talented clockworker I have ever met, and he talks animatedly with those who know and appreciate clockwork magic and automata. If you are looking for a mechanical helper or clockwork gadget, this is the place to come. Clockworker’s Charm. Whenever Mubarak casts animate construct, the duration of the spell is increased by 4 minutes. Golem Form. Mubarak can transform himself into a golem or clockwork creature of CR 10 or less for up to 10 minutes. He retains his Intelligence, Wisdom, and Charisma and the ability to speak and cast spells. Otherwise, this ability functions as the druid’s Wild Shape ability. Heated Body. A creature that touches Mubarak or hits him with a melee attack while within 5 feet of him takes 5 (1d10) fire damage. Heated Weapons. When Mubarak hits with a metal melee weapon, he deals an extra 3 (1d6) fire damage (included in the attack). Illumination: Mubarak sheds bright light in a 10-foot radius and dim light for an additional 10 feet. Command Construct. One construct that Mubarak can see within 60 feet must succeed on a DC 17 Intelligence saving throw or become friendly to the mage and obey his commands. This effect lasts for 1 hour, until the mage uses this ability again, or until the construct takes damage from Mubarak or his allies. If the saving throw is failed by 5 or more, the duration is extended to 6 hours or until one of the other conditions is fulfilled. When the effect ends, the construct is aware it was controlled by Mubarak. Hammer. Melee Weapon Attack: +7 to hit, reach 5 ft., one target. 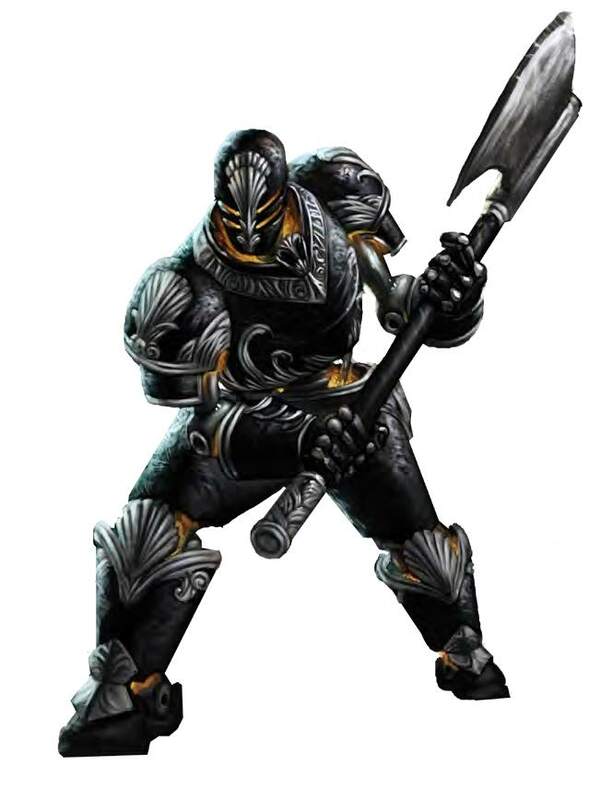 Hit: 7 (1d8 + 3) bludgeoning damage, or 8 (1d10 + 3) bludgeoning damage if used with two hands to make a melee attack, plus 3 (1d6) fire damage. Already a master of his craft, Mubarak spends his time constantly inventing new clockwork devices and automata. Some of these constructs and gizmos are dangerous or unpredictable, but this doesn’t concern Mubarak. The azer can call upon several clockwork creatures, including clockwork hounds and myrmidons (see Tome of Beasts), to defend his shop from robbers or other troublemakers. Mubarak sold an ornithopter for a huge price to Mushir Faruq Mutakabbir, an influential efreeti noble, but regrettably he has not yet received payment. The azer plans to visit the great duke to raise the matter and is looking to hire a group of impressive bodyguards to accompany him. Irfan al-Zarqa, wealthy sybarite and friend of the Sultan of Siwal, solved an ancient, bronze puzzle box said to open a portal to a “realm of ultimate sensation.” Irfan is now trapped in this other dimension and the sultan would like his friend back. Can Mubarak reopen the puzzle box, so the PCs can mount a rescue mission? An elderly fire jinnborn named Saffiyah al-Razzaq purchased a clockwork device from Mubarak designed to slow the aging process. When she took the spider-shaped contraption home, it attached itself to her arm, piercing her skin with its needle-like legs. She immediately felt healthier and stronger, and the wrinkles on her face faded away. The drawback is that she must drain the vitality of the young every night to power the device. Now she is stalking innocent victims throughout the city, leaving shriveled husks in her wake. Can the PCs put an end to the killings and confront Mubarak who has several more of these devices for sale? In my visits to the bazaar over the years, a lot of establishments have come and gone, but these have stood the test of time, becoming beloved institutions with a loyal clientele. Char and Scorch are a pair of dim-witted magma mephits that run the Big Grill, a place selling a wide variety of smoked and barbecued meats—everything from auroch and giant elk to roasted gorgon and purple worm steaks. The meat is generally served very well done and is coated with a nearly inedible spicy glaze made with very hot infernal chilies (DC 18 Constitution saving throw or become poisoned for one minute, save ends). Hook—A regular efreeti customer has demanded a unicorn steak pita for tomorrow’s lunch and the two mephits have no idea where to source the meat from. Are the PCs willing to help? Bel’shun’s Smoker’s Paradise is a shop selling all manner of sweet-smelling tobaccos and exotic incense, many of which have magical properties, as well as beautifully made water pipes sized for humans, efreeti, and fire giants. Bel’shun is a fire jinnborn whose powerful jinn patron lives in an opulent mansion in the smartest part of the city. Bel’shun has brick red skin, golden hair, and a long aquiline nose; he dresses in a djellaba of crimson silk adorned with gold coins and other trinkets. His deep black eyes flicker with a blue flame when he is nervous. Hook—One of Bel’shun’s customers experienced a strange vision in which the PCs appeared, battling an angry genie whom they had inadvertently freed from a copper urn. The Shackle Shop specializes in unbreakable chains, iron slave collars, bronze manacles, and branding irons marked with the sigils of efreeti noble houses—everything a cruel overseer needs to keep their slaves in line. Lysandrix, a salamander and former efreeti slave, was given his freedom by his master after three decades of loyal service. He set up this shop in the bazaar and made money off the misery of his kin and wretched humanoids. Lysandrix’s forge work is of superior quality: the DC to break one of his chains or pick the lock of his manacles is 10 higher than normal. Hook—Lysandrix’s sister is still a slave, and the salamander’s former master has ignored his pleas to grant her freedom. Lysandrix offers the PCs a set of magical dimensional shackles as a reward for sneaking into the efreeti’s estate and unlocking his sister’s manacles with the key he provides. Pyramids of Spice is an aptly named shop near the Brimstone Gate, one of the bazaar’s four entrances. Dozens of brightly colored mounds of different spices, herbs, and teas sit in wooden trays on the tables filling this shop. The owner is a red-scaled, fire-breathing dragonkin named Ansa Khetek, a spice merchant originally from the Southlands of Midgard who came to the City of Brass twelve years ago to trade in exotic chili peppers, saw an opportunity, and never left. Ansa sells her wares to some of the city’s finest restaurants and wealthiest efreeti nobles, including the grand sultan himself. She has an incredible sense of smell and ironclad (but also very refined) taste buds. Hook—The last batch of infernal chilies Ansa purchased from her supplier was not hot enough, and her customers are complaining. She needs a fresh batch urgently and is willing to pay the PCs a hefty fee if they will fetch her some from the Eleven Hells. Read more on the jann and the City of Brass—and read other great articles—in Warlock, only on Patreon!